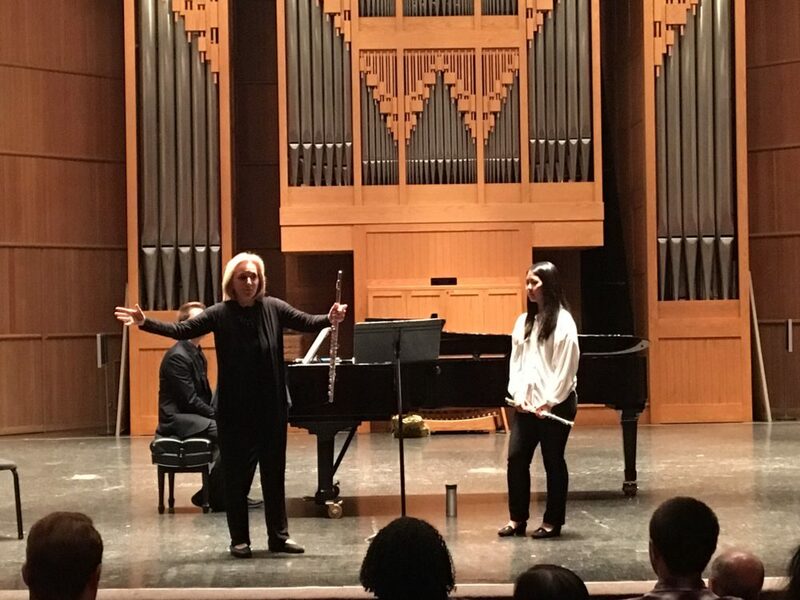 On Feb. 26th Carol Wincenc, world renowned flutist of the Les Amies Trio, conducted a Master Class at the UTSA Recital Hall for UTSA and YOSA musicians. The class started with all the students (and audience) on stage. 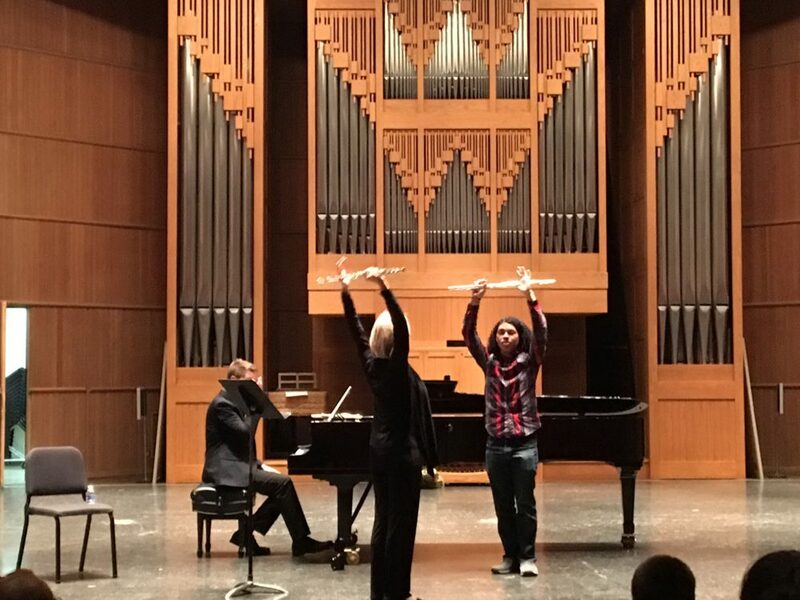 The musicians’ flutes became part of their bodies as Carol led us all through a series of stretching and breathing exercises. 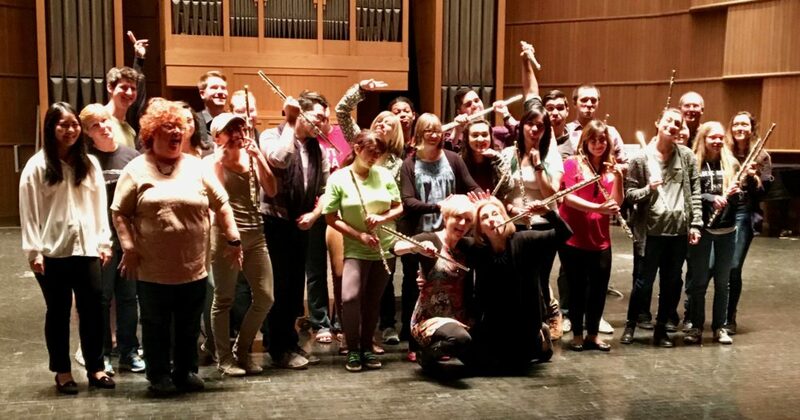 Everyone was now totally relaxed and completely involved in the Master Class. Five students, 2 from YOSA and 3 from UTSA then played their pieces with the accompaniment of Mr. Joshua Pepper on the piano. Musicians all received gentle and invaluable advice. A young musician had just started her piece when Carol came onto the stage and proceeded to waltz around with her counting the beat. The musician restarted her piece, a waltz, now with impeccable timing. A student who had played the Saxophone earlier in his musical life had the niceties of the differences in breathing techniques needed for the flute explained to him. After the musicians had finished all of us were again on the stage with Carol doing post playing breathing and muscle loosening exercises. Happy and excited conversations were heard from everyone. This was indeed a forerunner of the wonderful concert that was in store for the SACMS audience the next afternoon. 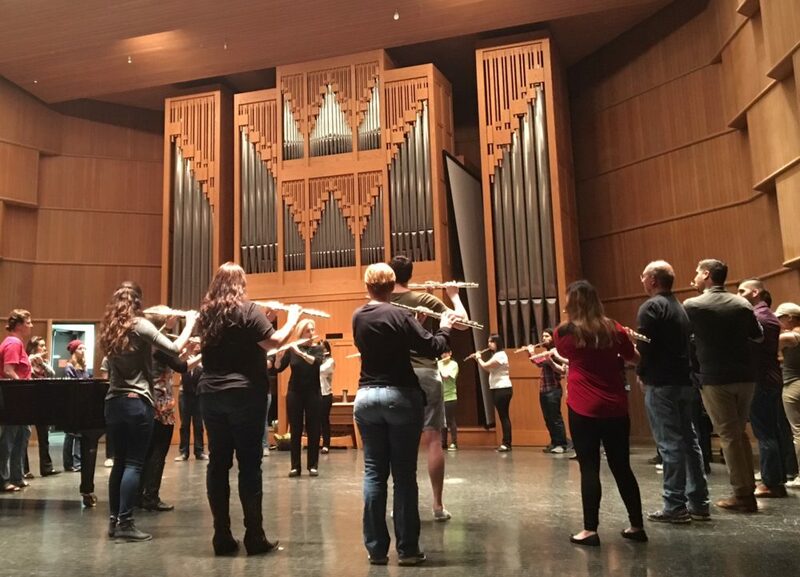 Grateful thanks to Allyson Dawkins, SACMS Chair of Education and Outreach and to Rita Linard, UTSA Professor of Music for organizing this amazing Master Class.